Just minutes before Thursday’s conference call, Strikeforce and Showtime issued a joint press release announcing they had finally come to terms on an extension. Although the bulletin let the proverbial cat out of the bag, several details were revealed during the call. The biggest takeaways from today’s powwow were that Strikeforce’s fighters, including superstar Gilbert Melendez (Pictured), aren’t going anywhere, except the heavyweights. The 265-pound division will soon be yesterday’s news. Strikeforce will host eight live events per year. Neither party was willing to divulge the duration of the extension. The new deal officially kicks with their January 7th card. It was strategically designed to begin during the network’s Free Preview Weekend so roughly 60 million people can watch it. Strikeforce Challengers is not a priority at the moment. It sounded like they might do away with the series. 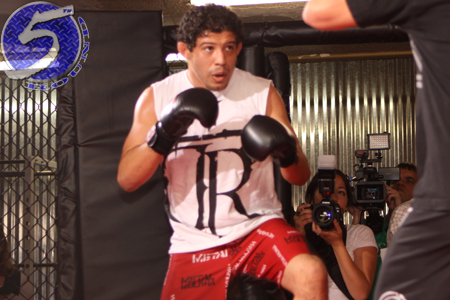 Dana White said he’s got Strikeforce fighters sold on the organization, including Gilbert Melendez. White claims the lightweight champ is happy to be there and isn’t going anywhere anytime soon. After the Heavyweight Grand Prix wraps, the winner will fight one more time against a top tier 265-pounder. Strikeforce will then eliminate the weight class. There’s still no definitive date for when the HWGP will resume, it’s still targeted for the end of Q1 2012. Strikeforce intends to focus on the lighter weight classes and women’s divisions moving forward. Scott Coker will continue to work Strikeforce’s day-to-day activities and White will oversee things. White will start attending all Strikeforce events. Coker said they aren’t sure how or when they will crown new welterweight and light heavyweight champions. M-1 Global extending their partnership with Showtime is a possibility, but that isn’t a priority for the network. There was a firm stance taken by White and Showtime stressing that Strikeforce is not a secondary brand – they are a legitimate MMA organization and not a feeder league for the UFC.